Jesse Hagopian, a high school history teacher who was pepper-sprayed by a police officer in an unprovoked attack, says that what happened to him is reflective of the police brutality that is rampant across the United States. 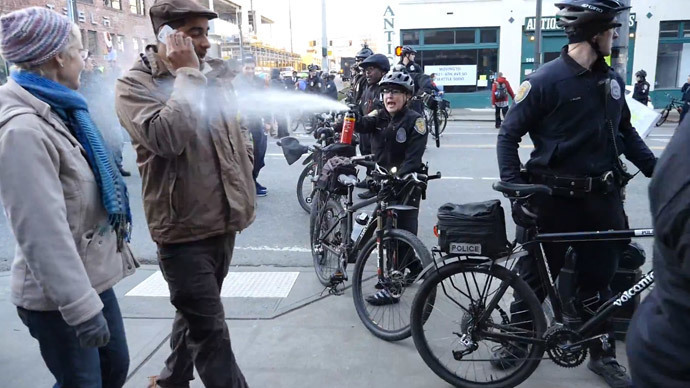 Hagopian – an activist promoting black causes in the Seattle area – was pepper-sprayed by a police officer after speaking at a Black Lives Matter rally on Martin Luther King Day. He was walking away from the gathering, on a sidewalk, when he was suddenly pepper-sprayed in the face. He has decided to sue city authorities and the police for $500,000 in damages. In video footage of the incident – which was filmed by a bystander, and where Hagopian is clearly visible – a small crowd is standing on the sidewalk and in the road. A female officer in a line of other officers appears to drastically overreact to the situation. She screams at the people facing her – who do not appear to be any threat whatsoever – to move back. She pepper-sprays them just as Hagopian is walking past at a normal pace while chatting on his mobile phone. The other officers remain calm and silent, but do not intervene to stop what appears to be an overreaction by their colleague. The pepper-spray left Hagopian with searing pain in his eyes, ears, and face. The history teacher said city authorities have not commented on the incident, even though it happened almost two weeks ago. “We still don’t have the name of the officer...I hope the city will respond rapidly to address this incident and others like it. I’m not the only one who’s faced this type of overreaction from the police here in Seattle,” he told RT. He explained that the police officer's actions in Seattle are reflective of the wider problem of police brutality in the US. “Every effort to curb police brutality seems to be met with more force,” Hagopian said.